This post is to store and share my MA Dissertation. A pilot-test of a visualization and set of evaluation rubrics for factors affecting the promotion of international-mindedness and global engagement (IMaGE) of a school. After starting this investigation with my Education in an International Context paper, and building on it through Research Methods in Education, I refined the idea, developed the rubrics and dug deeper into the research literature in the process. Through the process I learned a lot about the current state of research in international education, and I think the continued development of the web chart and rubrics could be a a never-ending task. The end goal of the dissertation was to pilot-test a draft of the rubrics using a cross-section of volunteers from my own school. This allowed me to see the issue from different perspectives within the school, to test the rubrics (and statistics), and to spot issues and errors in the tools. I thank them all for their time and interesting perspectives. The further I got into this research, the more concerned I became with the issue of homogenization (Fertig, 2007, 2015) or isomorphism (Shields, 2015), in international education. I see these issues as potentially a significant limitation to the applicability of a tool such as this, or any other which applies a universal set of descriptors to a global industry. Where the design of the project intended to try to capture the diverse and often hidden elements that contribute towards as schools IMaGE development, I worry that working towards a set of prescribed descriptors may pull a school away from the context-specific ‘unpredictables’ that make it international (and interesting) in its own right. How do we strike the balance between observing and enhancing the ‘IMaGE’ of the school with the tendency towards a sterile centre-ground? I’m not sure at this point what life this research will have beyond the MA, but I remain interested in its development, testing and critique. Full references for the dissertation are included in the uploaded document, with live links where possible. These few are of particular interest. Fertig, M., 2007. International school accreditation: Between a rock and a hard place? Journal of Research in International Education, 6(3), pp.333–348. Fertig, M., 2015. Quality Assurance in National and International Schools: Accreditation, Authorization and Inspection. In Hayden, M., Levy, J. & Thompson, J. (7th Edition). The SAGE Handbook of Research in International Education. pp. 447-457. Shields, R., 2015. Measurement and Isomorphism in International Education. In Hayden, M., Levy, J. & Thompson, J., 2015. The SAGE Handbook of Research in International Education. (7th Edition). London, UK: SAGE Publications Ltd. pp.477-487. The whole of The SAGE Handbook of Research in International Education (7th Ed) is an important read for anyone looking for the current state of play for international education research. I wrote a brief recommendation here. The full dissertation (edited lightly for upload) is posted below. Categories: Bath MA Int Ed, Internationalism | Permalink. Eyes-deep in reading for the MA dissertation, with 200 links in my Paperpile and counting, concurrently thinking about future professional learning at school, and following the threads of developing the IMaGE of a school, I keep stumbling across articles, books and papers that offer distractions from the work at hand. The result is a bent mind and a head full of ideas; a productive pseudo-procrastination that I’m trying to weave into a narrative, or at least keep stored for later reference. It looks like a streamlined ITC certificate can be earned through the European Council of International Schools, with five main standards. Continuing professional development as an international educator –teachers will develop their own reflective practice as a way of deepening the value of their continuing professional development. Schooling and education should be based on the goal of everyone achieving success, rather than allowing success for some and failure for others. Schooling and education should be based on the assumption that learning is lifelong, not a ‘once and for all’ activity. Schooling and education should be based on the assumption that competition is best when ipsatively rather than normatively based. Schooling and education should be based on the assumption of inclusive not exclusive practices. Clearly there is much to read once I get past this dissertation. With Faculty & Development being just one of eight radials in the IMaGE of the school, I find my mind being expanded with every day of reading. It will be a challenge to martial this all together, for sure. Steiner, Miriam. Developing the Global Teacher: Theory and Practice in Initial Teacher Training. 1996. Foreword by Tim Brighouse. Categories: Bath MA Int Ed, Internationalism, Leadership, Professional Development | Permalink. It’s crunch time for my MA International Education studies at the University of Bath, with a big literature review in progress and some data collection coming up, aiming to submit by the summer break. As much as I’ve loved the study, I’m looking forward to reclaiming some balance. My plan for the dissertation is to update and pilot-test my web-chart of the international dimension of a school, aiming to tackle the challenge of defining a nebulous concept through visualisation, based on self-reporting, to generate “the IMaGE of an international school“. (IMaGE = international mindedness and global engagement). The small-scale case-study will generate an IMaGE for my own school, and the pilot study will help evaluate the usefulness of the visualisation and metrics. A sample of the web chart in use, with the IMaGE showing the evolution of a school or a change in perception. The eight radials are still under development, and there will be descriptors for each in the final project. At first glance, where would you rate your won school? What do you see, think, wonder about the results of this (imaginary) school? 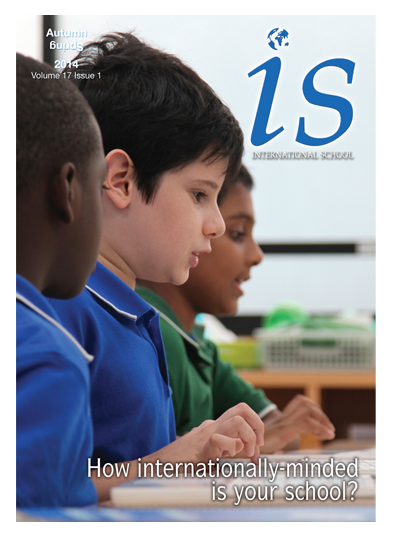 The idea of trying to evaluate or measure the ‘internationalisation’ of a school is not new: we already have metrics, practices or handbooks from various organisations, including the IB, CIS, ISA, ACE, OECD. This project aims to learn from, adapt and distil these qualities into an accessible tool that will generate a ‘visual definition’ for a school, as a starting point for further investigation. Although some of the ideas within the chart have evolved a lot since the initial idea in 2012 (and I have found many more studies), here is the original assignment. Categories: Assessment, Bath MA Int Ed, Internationalism | Permalink. Are IB Schools Trivium21C Schools? Update (Dec 2018): This is a really old post now, but something I reflect on regularly. I have some related posts at the bottom. Since this review in 2014, Edutwitter seems more divided, which is a shame; we all want the very best learning for our kids, and our contexts can be dramatically different. The more I see this, the more I’m convinced that truly creating a culture of thinking is what can unite contrasting viewpoints, transcend programmes and help focus on quality implementation. Since this post was originally written, a lot of new resources have come out around learning science, which are also really useful. There is a greater push in the IB world towards learner agency and I’m now working in a school making some really bold moves towards the future of learning. These ideas are not mutually exclusive and they have a lot to complement each other. It is our privileged position to build models of what they could be and share the journey as we go. The body text is unedited from 2014, except where strikethroughs indicate change. I was lucky enough to get this for a pound on Amazon, but it is worth more. Trivium 21C by Martin Robinson. I recently finished Martin Robinson’s (@SurrealAnarchy – now @Trivium21C) excellent Trivium 21C: Preparing young people for the future with lessons from the past, the author’s journey through the history of education to find the inspiration for the education he wants for his young daughter. As I read I became more and more convinced that he was essentially describing a high-performing International Baccalaureate education, combining a well-taught, high-quality curriculum (the Grammar), with the development of skills and wisdom to really inquire through critical reflective thought (the Dialectic). With the grammar aligning with a more traditionalist view of education and the dialectic with a more progressive set of methods, Robinson’s book hits very close to my own views and ideals on education and where I want it to go: a set of principles and practices that combine the best of both worlds. The third element of the Trivium, the Rhetoric, is the capacity and engagement of the student in performance, communication, discussion, presentation and participation in authentic and meaningful (global) communities. Along the way, Robinson takes us through the history of education, from the ancient Greeks to now, at each step highlighting the competing paradigms of learning. It seems as though the progressive vs traditional debate mud-fight has been raging since long before the written word! He interviews leading educational thinkers on both sides of the progressive/traditional divide and my thoughts on Ken Robinson’s TED Talks agree generally with his – we do need content in our curriculum, but we need to ensure it is the right stuff, taught well. What is the culture we want to preserve into the future? What does a Trivium 21C education look like? 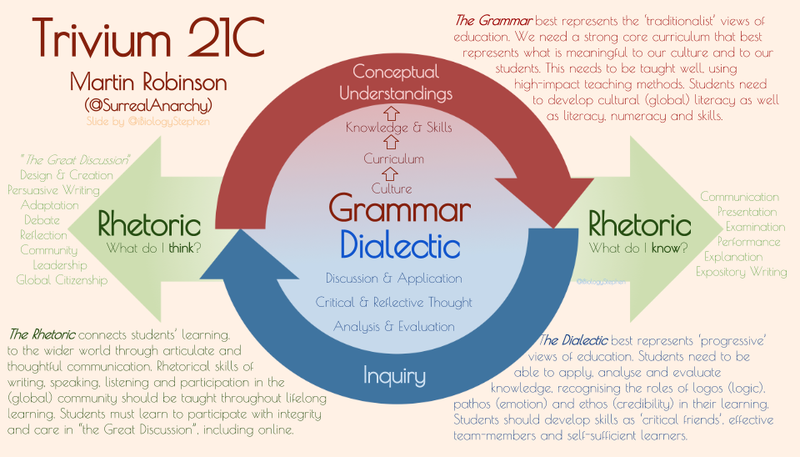 Robinson describes the grammar and dialectic as cyclic in nature, the grammar (content) giving the raw materials for the dialectic (inquiry). The rhetoric is ongoing, connecting the student’s learning to the wider world through communication. The diagram below is my attempt to summarize Trivium 21C in one graphic. My attempt to represent Martin Robinson’s Trivium 21C in a graphic. Can you see the connections here between the Trivium and a well-implemented IB continuum of programmes? Is an IB Education a Trivium Education? Robinson’s descriptions of his Trivium 21C align very closely with the principles and practices of a well-implemented continuum of an IB education. Although an IB education is inquiry-based, we need to be careful to define this inquiry as critical reflective thought; guided inquiry based on a strong curricular and pedagogical foundation. Inquiry in the PYP may well be open-ended and student-directed, but the rigorous planning and careful, responsive teaching that takes place are exemplary to all teachers. The assessment descriptors of the MYP, as well as the broad and balanced, concept-based approach to the student’s total curriculum give a rounded and challenging experience. Founded on strong unit planning and vertical and horizontal articulation of curriculum, there should be room for inquiry, as well as effective preparation for the higher-tension IB Diploma. In the Diploma itself we see the broad and balanced approach remain as students study not only six subjects, but really exercise their dialectic and rhetoric muscles through the Theory of Knowledge, 4,000-word Extended Essay and challenging learning outcomes of Service (MYP) and Creativity, Action and Service (IBDP). The IB Learner Profile – or the Philosopher Kid? Click through to read more. IB Learner ProfileThe philosopher kid of Robinson’s Trivium21C is the embodiment of the IB’s Learner Profile. Towards the end of the book, Robinson makes mention of the IB’s programmes, referring to the dialectic and rhetorical nature of the Theory of Knowledge course in IBDP, the criterion-related assessment of the MYP and the rhetorical (participatory) elements of Creativity Action and Service. The hierarchical nature of assessment descriptors in the MYP and DP highlights the content-first (Grammar) approach to teaching, learning and assessment. Students can experience success with a good level of content knowledge, but to really excel they must put it to action, with the higher-order command terms driving the higher achievement levels (explain, analyse, evaluate, design, for example). On paper, an IB education would seem to have all that Robinson seeks in the Trivium 21C, but even within this globalized framework for an international education there is a high degree of variability. This is key – a well-implemented IB continuum of programmes has it all. A poorly-implemented programme may lack in one or more elements of the Trivium; however the frequent and constructive programme evaluation processes in place with the IB should help schools improve. I highly recommend reading this book, though it is not a quick read by any means; you may well need a note-pad. It has a cast of characters greater than Game of Thrones, yet you’ll feel less soiled once finishing (and none of the ideas are killed off in such gruesome ways as GRRM does his creations). It is quite high-altitude, and though I’d like to recommend it to new teachers, it might not be the practical volume they need to survive. It is an excellent provocation for school leaders and coordinators, as well as those studying curriculum development and educational policy at a more academic level. I would certainly recommend it to anyone who places themself on either side of the progressive/traditional education debate. Both Robinson and I share many values and ideas on the education we want for our children. I have the deep privilege of not only being able to choose it for my own kids, but of being in a position where I can help shape it through an IB education. I want my kids and the learners in my school to be excited, globally aware and motivated to learn more, following purposeful lines of inquiry, built on solid foundations. Over the last couple of many years, my thinking on education has matured, largely as a result of experience in teaching coordination and curriculum development, but also as a result of taking a more academic approach to learning through my MA studies. Is this an Inquiry with an “I” or an enquiry with an “e”? Defining Inquiry: Critical Reflective Thought (re-defining inquiry to fix its ‘fluffy’ reputation). Content & Inquiry in a Google World (we need a strong foundation of knowledge from which we can build meaningful inquiry). Curriculum as a compass? On Wayfinding and the role of the expert teacher. MA Assignment: MYP Mind the Gap (5,000 words on this whole idea that we need to look to both sides of the traditional/progressive debate and cross the MYP-DP inquiry gap with effective practices and meaningful inquiry). Builds on my IBAP Regional Conference breakout session here. Is every experience a ‘moving force’ in our curriculum? Reflecting on Dewey’s words and the importance of a high-quality foundation of curriculum. The Inquiry Crossfader: Effective vs Authentic Learning? Another take on the false-dichotomy, in which we use a DJ crossfader to set the level and type of inquiry taking place in the classroom. The Gradebook I Want. Trying to marry IB-style criterion-related grading with standards-based grading in order to allow a greater personalisation of pace and learning against the curricular objectives. “Learning is about living, and as such is lifelong,” building on this quote from Dewey-scholar Bente Elkjaer to develop a definition of learning. You can’t differentiate mediocrity. On the need for a strong core curriculum before we talk pedagogy. “Now that’s what I call Curriculum.” From two six years ago, a post on the MYP as a ‘greatest hits’ collection of curriculum theory and practices. Alongside this “Whose Culture? Whose Curriculum?” on the culture-curriculum connection and the interesting new cultures we create in international schools. Categories: Bath MA Int Ed, Curriculum, Educational Philosophy, Inquiry, Middle Years Programme, Personal | Permalink.